This chapter book full of fun, exploration, determination and trial and error, is from the series Judy Moody and Friends for the 6+ age group. All the children are practising their Yo-Yo skills at the Frozen Yogurt shop. The best player will get to name the new flavour. Frank, unlike his friends, has never won a contest. He longs to have something to boast about as the others do. He is last to show his skills with the Flying Skunk. But things go wrong, for the ‘skunk stunk’ and he ended up breaking his glasses. Feeling a failure but still optimistic, Frank enters Cookie his parrot in the in the Pets are Family contest. But Cookie chooses the wrong moment to refrain from public performance. Refusing to give up, Frank is determined to try one more time. The Great Third Grade Breakfast Bash and Waffle-Off will determine who can make the best-dressed waffles. Frank feels the Blue Ribbon he longs for is within reach with his innovative exploding waffle. Unfortunately, his Mount Vesuvius has a meltdown. Just when he expect things to turn out one way, they do a flip and take an unexpected direction. 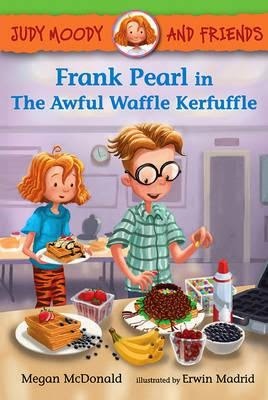 Frank is a fantastic role model for young readers. He encourages children through his actions to be persistent, give things a go, be in it no matter what, and always try to have fun. It will be your turn to win sometime. Don’t ever give up! The whole series has familiar faces and names, terrific characters, lots of lessons to be learnt about friendship, and many other positive reinforcements. The illustrations are outstanding and complement the text perfectly.